PLAYABETS – ALL BETS ARE ON! Playabets have tried to stand out from the pack and give their punters a truly unique offering across mobile, desktop and retail sports betting. Playa’s website is well designed, easy to navigate and very eye catching. They offer some very unique products in their live 5 minute Keno draw as well as their live Greyhound Racing betting options. Playa built their business from a small retail betting venture in KZN into one of South Africa’s household names for any sport punter. They have an extensive retail betting platform with numerous shops around South Africa as well as their ultra modern digital betting platforms thus catering for all of South Africa’s sport betting punters. Playabets is very active in the social media space alon with running current promotions, they really are a punters bookmaker and help their customers across all platforms. 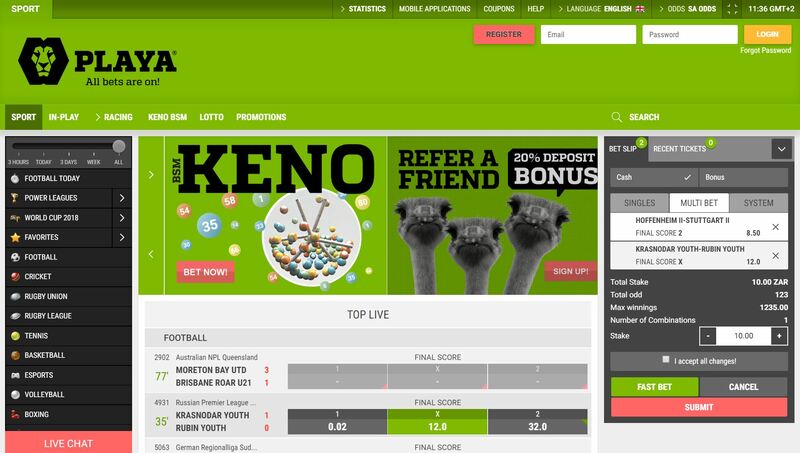 Playabets offers over 12 000 live in play events monthly and a whole host of prematch markets, their Live Keno and Greyhound Racing differentiates their offering however they still lack any sign of horse racing on their site. Empty Bet is a form of betting where you can select any sports bet of your choice, even if the bet is not available on the site at the time of requesting. If the proposed bet refers to an event that is not included in our standard betting offer, and the match has not yet started, then you can request odds based on any outcome that you choose. These bets will be bound by our standard pre-match betting rules as well as our terms and conditions. You can also request an Empty bet of your choosing for a match that has started. This bet will be bound by our standard in-play betting rules and terms and conditions. Empty bets outcomes must be able to be measured with clear sources of information and data for resulting. HOW DOES EMPTY BET BENEFIT ME? Empty Bet allows you the customer to bet on absolutely any sporting event or selection even if it is not advertised on our site. You may have a unique bet that no one offers! HOW DO I TAKE AN EMPTY BET? 1. Click on the empty bet button on the homepage or on the betting slip on the mobi site. 2. A window will open where you must enter the name of the event and the type of bet for which you want odds. 3. Click Submit and wait a couple of moments for a ticket to appear in the bet slip. Enter the amount you wish to bet and then click submit. 4 After a few seconds, your bet slip will be pop up with odds for your selection. At this stage, you cannot change your stake. If you are happy with the bet, click the accept / submit button to confirm. 5. You will receive a message confirming that your bet has been placed.